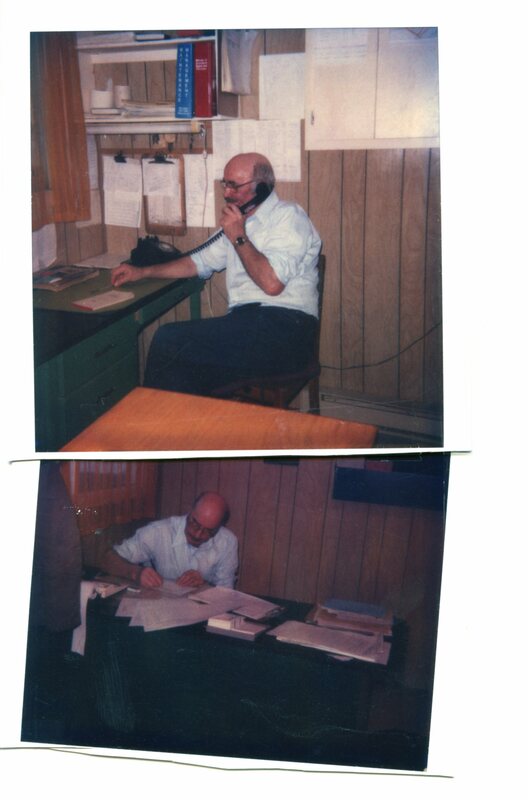 From the time I was born till he retired, Dad worked at the department of highways as a clerk. Now a clerk for the department of highways may be an office job, but the offices them selves were usually one room buildings attached to bunk houses the department had set up in various working areas around the province. Sometimes, when I was young dad may have stayed at these locations overnight or worked later than is the norm now. One of the curiosities I remember was dad calling home on the old mobile phones and having to say over after we finished speaking. As a kid one of the great things about Dad’s work, was that in summer time I could actually go spend the day at his work site, in many of the locations. When I was a small boy, he worked out of Shoal Harbour Pit, a pipe yard for making concrete ditch pipes. The old pit is gone now, but it was located where the ball field is now. I can’t really remember much about this location except the little white shack dad worked in. For another summer at least he worked out of a similar camp in Robinson’s Bight, not where the community is now (there wasn’t one there then) but closer to lady cove, in an old gravel pit by a brook. As a kid I spent days there with him, playing around the area, catching trout in ice cream tubs, catching water skippers (I hadn’t remembered water skippers in years till I started writing this! ), and of course sharing lunch from dad’s seemingly huge lunch can. Mostly though, i remember dad working at the salt shed in Clarenville, first in the old style camps, and the later, as seen in the picture a better building, still with an attached kitchen and bunk house. As a kid I’d go to work with dad, and sometimes spend the day, exploring the yard, playing with the glass beads they used to add to paint for road lines, marveling at all the salt in the salt shed, making castles out of the sand blasting sand, and of course playing poker with the adults at lunch time :). Other days tho, I got a kid’s delight, heading out on the old float (flat bed) with Ches Baggs, or on a dump truck with someone, perhaps Ted Ryan, I forget who did what now, or hanging out with Paddy Mitchell, though I complete forget what he did. Also trips on the grader, bulldozer, and god knows what else anymore; all in all a young boys delight. So many characters were there too, with their many accents and mannerisms, and so much shared food and fun. Of course nowadays, you’d never get away with such things, nor would you likely trust your child to be gone for the whole day with a lunch can on heavy equipment with co-workers you really only knew from work. But it was a more trusting time, and a smaller world. And I was lucky to have got to spend so many wonderful days with such patient men who took a young scrawny kid and spent the day with him, as well as spending wonderful days with my dad.